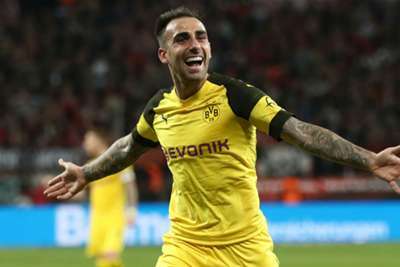 He was loaned to Dortmund in August and has flourished under Lucien Favre's tutelage at Signal Iduna Park, scoring eight goals in just five games. Dortmund have a €23m clause to make the deal permanent and are expected to activate it. But asked about his time at Barca in an interview with Marca, Alcacer said: "Some may want to think that I might have lost the past two years from their viewpoint, I don't think I've lost two years. "In terms of the number of minutes I had it's clear that I'd have liked to play more, but I have improved a lot as a footballer and as a person. "I didn't have the minutes at Barcelona that we all want and now I am having them and things are going well." However, Alcacer believes simply being in the same squad as Messi has had a positive impact on him, adding: "He may capture the attention, but I also think he makes you a better footballer. In fact, many of the goals I scored at Barcelona were from his passes. "He gives you passes that leave you alone in front of the goalkeeper and all you have to do is score. So yes, he does capture the attention, but he makes you a better player." Alcacer has faced Atletico nine times but only won once. Asked whether it is "a toothache" to face a famously defensively stout side, he said: "Yes, totally. They are a team that concede very few goals and they leave few spaces, while they're always very aware of everything. For a striker it's frustrating. "It's clear that Atletico are a great team and a great club, a top club. But we need to make things difficult for them and go from there."